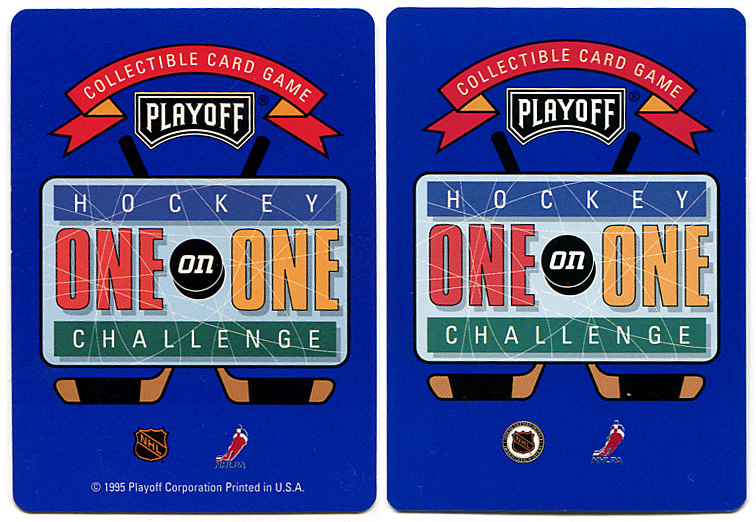 In 1995-96, the Playoff Corporation released a 330-card collectible card game (CCG) called One on One Hockey Challenge. 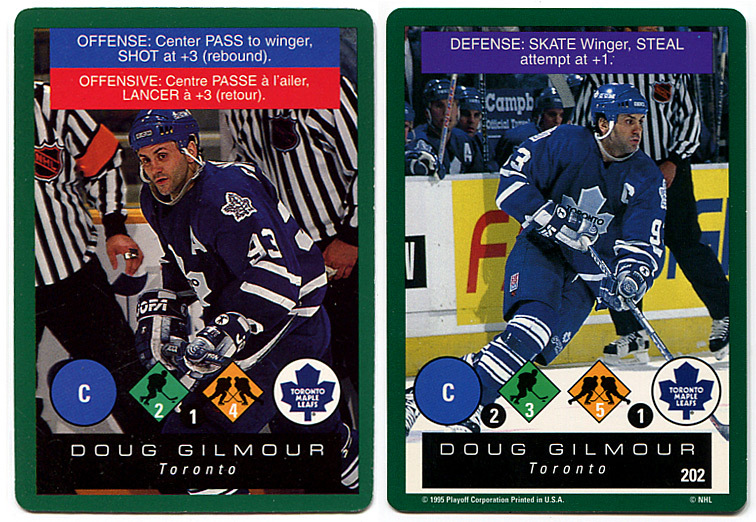 The game cards featured the top NHL players at the time, and contained instructions at the top and stats at the bottom that were used for the game. 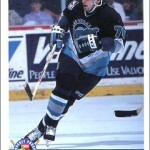 Sometime before the release of the actual game, Playoff released prototype cards that differ from the actual game cards in several interesting ways. More instructions: The first thing you may notice is that the text at the top on the prototype card (left) is in both English and in French. The cards that were actually released (right), contain only English text. It is interesting to note that both the packaging and the instruction manual are bilingual, so the game was sold in Quebec, despite the English-only cards. While this was a disservice to French-speakers, the removal of the French text — and especially that distracting red box — does streamline the look of the cards. 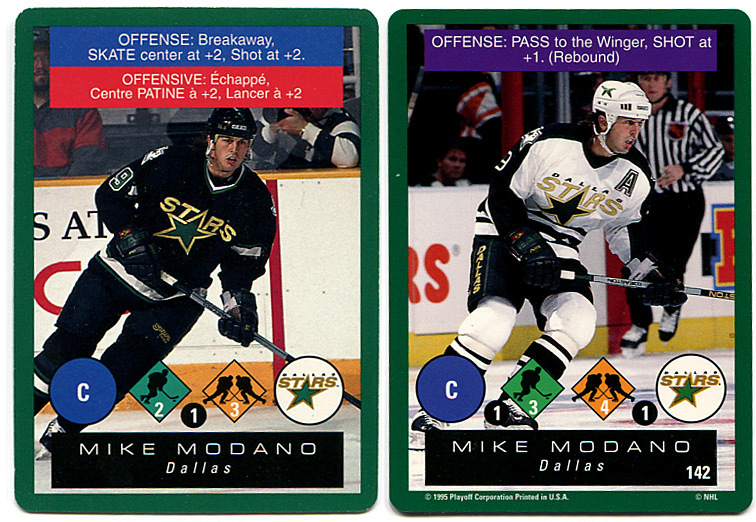 Different Photos: These prototype cards of Mike Modano and Doug Gilmour use unique photos. 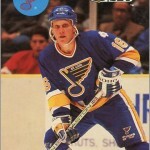 Both players had three cards in the One on One set, and none of the cards use the same photos as the prototype cards. Less stats: Another big difference is that the prototype cards have one less “stat” at the bottom. Between the green diamond and the yellow diamond on the prototype, you will notice a black circle with a number inside it. On the actual cards, though, there are two black circles with numbers — one to the left of the green diamond, and one to the right of the yellow diamond. Thus, we can infer that these prototypes were made before the rules for the game were finalized, as these numbers are used for actual game play. Numbers and Copyrights: The real game cards are numbered 1 to 330 in the lower right corner, and have copyright information at the bottom. The prototype cards do not have card numbers, but do have copyright information on the back, towards the bottom. 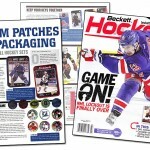 Beckett Hockey does not have any information on these prototypes. Neither does the old Charlton Guide. If you know anything else about these prototype cards — especially if others exist — please let me know. 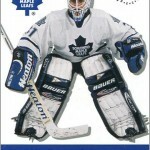 Interesting hearing about these cards again – talk about a memory of my childhood! I always heard there were prototypes when they came out but never have seen any. I wonder what the likelihood of these prototypes ending up accidentally being tossed into some the blaster boxes with the regular cards? I think these prototypes were sent out to card shops. I found these in a complete set, but was able to purchase just these prototypes, since I already have a set. 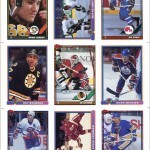 AJ, if you are interested in a complete set of 1995-96 Playoff — all the common and uncommon cards — I have a set for sale or trade. 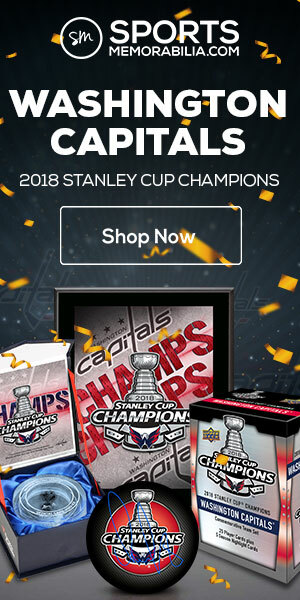 Thanks for the offer! I’ll certainly have a look. I have a complete set of the common’s which I have had from my childhood, but to be honest, I never really thought about doing the uncommons for this set. 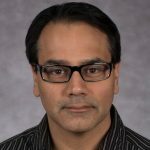 Hey Sal, I know this article is from 5 years ago, but any chance you have this one for sale? 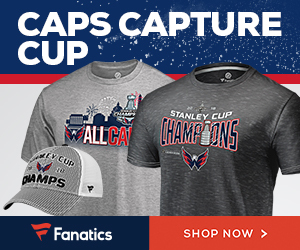 Email me if you do – tb_curran@yahoo.com – thanks! 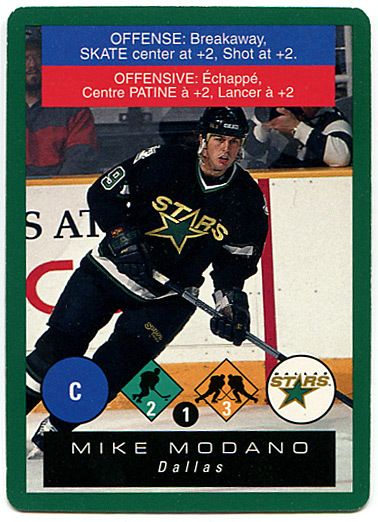 There was also a round coaster sized Modano as well (no stats) – I presume it was put out prior to the Modano/Gilmour listed above and just used to announce that the product was coming out. Thanks! I’ve seen that coaster, but wondered what the deal was with that. It seemed like an odd thing to make, given that it served no purpose in the game.